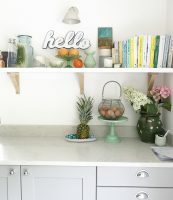 I’ve written before about the whole kitchen remodel process I went through. I love how many of you have got in touch with your kitchen plans and how many of you have been helped by the nerdery that I went through when designing ours. 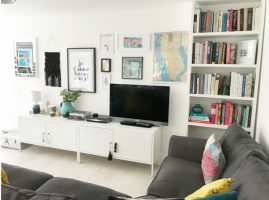 All those hours feel even more worth it when I know it wasn’t just our kitchen that benefitted from the hours I spent poring over tiles and taps. The chipped yellow bench that I made my husband carry (I was 6 months pregnant) across a giant flea market carpark in San Francisco, which then became the place all my cooking class students dropped their bags when they came to cooking classes, came back over the pond with us and fit one of the nooks perfectly. We hadn’t planned it, but it was almost like it was built to fit it. My Dad couldn’t get to grips with why we wouldn’t want him to sand it down and paint it for us. That yellow colour became one of the inspirations for the colours in the rest of the room. The second purchase was a giant grey sofa which sat, naked of cushions for about a year. We bought Ikea units to put the TV on and kind of forgot about the corner for a while. 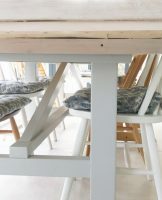 Then I saw the perfect one, with just the right shade of, what I call ‘bench yellow’ in it, crop up on my friend Lisa’s shop edit58. The rest of the colours in that cushion became the spring board for all the other bits we collected and added to the room over the years. It has a story and it makes me smile every time I sit down and that’s what lovely house things should do. A kitchen table is, cliched as it may be, the heart of our home. It is where we eat, do homework, create businesses, argue, share news and build friendships. 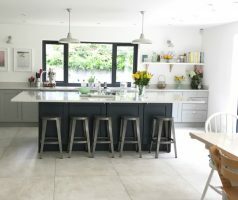 Our kitchen redesign gave us space for a whopper of a table but also left us with zero budget to buy one. So, inspired by the tables at one of my favourite coffee shops I came up with the idea of using scaffolding planks to make on. My dad was recently retired and eager to use his woodworking skills (see the yellow bench) but could not get his head around why I wouldn’t want to use proper wood instead. I won him round and we blagged a few planks off our builder. He built a frame and fastened the planks together to sit on top. Then he sanded them down and waxed them with a wax that had a pale white tinge. That’s when the fun started. The planks started to warp, so he had to clamp them together and fill the gaps. Cursing me and my weird furniture inspirations as he did it. We got their in the end though. Our table cost us less than £200 in materials and we can sit 14 people around it when we need to. There are certain bumpy spots where it isn’t advisable to put a wine glass or a laptop but that just adds character right? 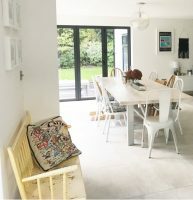 The chairs are a mismatched collection – my grandparents’ Ercols, the boys’ Tripp Trapps and a few that I picked up in junk shops in California, sanded and painted when I was pregnant and eager to settle in to a new home overseas. There were too many memories attached to these seats so I couldn’t leave them when we moved back. The most recent thing we’ve done was the thing that drove me mad. Once the builders had left and the walls stared at us pristine and newly plastered I hesitated too long to put anything on them. We started with pictures but what we needed was shelves. Trying to find someone to put them up for us was so hard – silly as I know they’re pretty straightforward. Finally we found a handyman who actually turned up. Within a day he’d built and painted them for us. He used solid wood, painted in an eggshell paint to match the walls and we used Ikea brackets for the floating shelf. I think they’ve transformed the space. Giving me space to put all the little bits that I love. I have so many cookbooks and having them upstairs always felt wrong. I wanted to be able to grab one as I cook or loll on the sofa. Now I can. The little floating shelf houses some of my most-used cookbooks as well as things I’ve picked up on our travels – the ceramic orange and the melon bowl from Portugal, the mini oil painting from a beach cafe in Cornwall, the hello sign from a cake shop in our old town in California and the blue and white ceramics from a little shop in Tahoe. The green glass cake stand was one of the first gifts my husband ever bought me. There are a few charity shop finds tucked in there too. Without this £15 shelf I’d not have the little pops of pleasure that I get every time I reach for an egg or a book. I just wish I’d cracked on and put it up sooner! I’ll post more when we make more changes. But for now, let me know what help you need with your kitchen. From the bits like this that make it lived in, to the more practical concerns you have as you reorganise or design the space you cook and eat in.